Rockwell Automation recently hosted the China - Australia Mining Forum at the Brisbane Convention Centre to showcase the latest advances in smart, safe and sustainable mining. Attended by more than 200 people, this year’s Forum focussed on streamlining the supply chain from pit to port and strengthening mining collaborations between Australia and China. While there was significant representation of locally based Chinese companies with interests in Australia’s resources industry, Australian attendees were drawn from a diverse range of multinational companies including Adani, Anglo American, BHP Billiton, Rio Tinto, GlencoreXstrata and Arrium Mining. The Forum opened with an insightful overview of Queensland’s mineral and coal industries and the opportunities for investment by Mr Brad John, Chief Government Geologist of the Geological Survey of Queensland from the Department of Natural Resources and Mines. Given the many new challenges faced by the mining industry due to the current global economic uncertainty and fluctuating commodity prices, improving productivity has become an increasingly critical item on the agenda of Australian mining businesses. Franz Wentzel, Director at PricewaterhouseCoopers delivered an informative keynote presentation titled, ‘Productivity not Austerity – the Mining Industry Productivity scorecard’, which detailed the importance of improving productivity during these challenging economic times. According to Geoff Irvine, Industry Manager-Mining at Rockwell Automation, leading companies are investing in technology to get more from the existing operations rather than invest in new greenfield projects. Attendees were also provided with a valuable insider’s view into the current status of China’s coal industry by Li Mingwu from the China National Coal Association. China’s mining industry is focussing on improving the safety, sustainability and productivity of their mining operations. Over the next five to ten years, China will be looking to change the landscape of their industry by having a greater proportion of their coal production stemming from large mining companies with improved safety and sustainability parameters. The third keynote presentation was delivered by Jonathon Deluao from Arrium Mining and highlighted the iconic ‘Project Magnet’, which has converted the Whyalla Steelworks to magnetite iron ore feed, creating a new revenue stream for the company by making available hematite iron ore for export sales. To achieve this, a completely integrated pit to port process control system was implemented that has successfully extended the life of the Whyalla Mining and Steelworks. The afternoon session of the Forum was divided into two concurrent streams with one focussing on automation and the other on power. Attendees had the opportunity to hear about the latest advances in autonomous mining, remote operations, automation, networks, power and safety from industry experts who discussed how companies could reduce inefficiencies and energy costs in mining operations. In a presentation about ‘Optimising Materials Handling Plant Automation’, Doug Lithgow, Director, MRA, discussed utilising the control system’s processing power to allow end users to address key issues such as system modelling within the DCS/PLC for materials handling, control tuning for conveyors, monitoring via vision systems and sensing. Also in the materials handling area, Tim Sheehy, Manager of Electrical Instrumentation and Controls at Sedgman presented an innovative global solution that was applied to a Relocatable Modular Coal Handling and Preparation Plant (CHPP). Dalrymple Bay Coal Terminal (DBCT) is one of the largest coal ship loading facilities in Queensland, which has implemented an Asset Management tool to assist in monitoring and auditing of control system assets. This presentation included a ‘live on-line’ demo, delivered by Allan Doherty, Senior Control Systems Engineer at DBCT, demonstrating the implementation of the Asset Centre software from Rockwell Automation and highlighting the need for comprehensive asset control. Anthony Manousso from Anglo American presented ‘Increasing the safety and productivity of yard machines via an Ethernet GPS’ while Gavin Strack, Manager Process Control, Barrick Australia Pacific gave an interesting presentation remotely via a Cisco Video over Ethernet connection. An entertaining view of the benefits of automation was presented showing the way Human Machine Interface Graphics should be designed, utilising interesting and interactive graphics throughout the presentation. 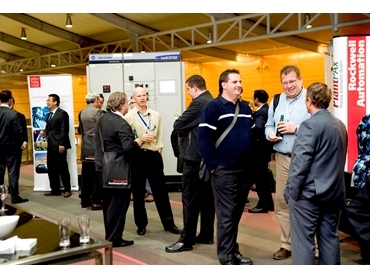 The China – Australia Mining Forum featured displays from Cisco, SMS Management and Technology and Panduit. Rockwell Automation also displayed a PlantPAx system demonstration as well as Intelligent Motor Control Centres for mining applications.